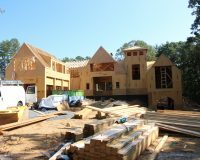 Over the past decade Grandfather Homes has worked tirelessly to streamline the complex custom build process. We have utilized our experience and expertise to organize custom builds into a seamless progression of events. 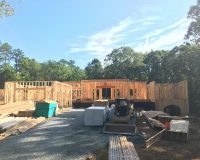 The imagery to the left shows the journey from concept to creation: the 6,700 sq ft Forest Manor with over 1,300 sq ft of outdoor living located on a wooded lot off Belknap Road in Foxcroft. Local architect, Bryan Mermans, originally designed this contemporary plan for Grandfather Homes to build as a speculative home. Our creative process generally starts with acquiring land then creating a vision for the land’s highest and best use. Our sales and marketing team then takes the vision to potential home buyers for feedback. 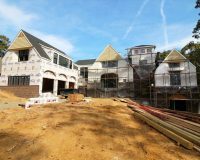 This particular home quickly went under contract and transitioned into a custom build because of its’ overwhelming popularity with the Foxcroft community. The custom clients were connected with Tammy Coulter Design to make the remaining selections for the home and our landscape architect to design the outdoor living package (including a dreamy poolscape!). 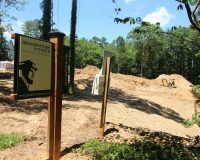 Behind the scenes, the office crew pulled permits and obtained a land survey. The project manager cleared the lot to pour footings and start building the basement foundation. 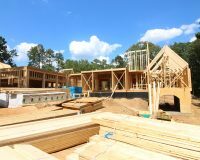 The framing stage started immediately after the foundation inspection. 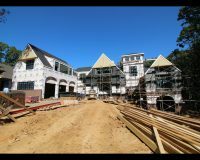 The Forest Manor featured intricate ceiling details; these architectural details made framing a bit more complex. After almost 40 days and a framing inspection, the roof was ready for shingles. The project manager marked the home for cabinetry and electrical to pinpoint exact locations to accommodate the homeowners’ needs. Rough mechanical, plumbing, and electric began on the interior. 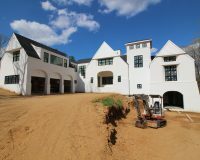 Windows and exterior doors were installed on the exterior. 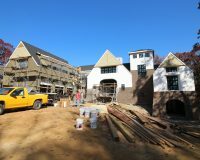 Brick and stucco veneer were applied (and painted white!) while insulation, Sheetrock, and trim were installed on interior. Next came the fun part – custom cabinetry, designer lighting, stunning tile, European oak hardwoods, and Thermador appliances furnished the home. 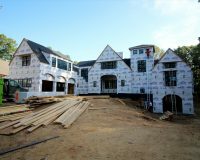 The Forest Manor’s personality began to shine throughout these phases. 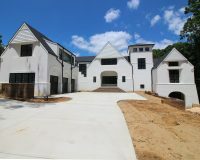 Driveway and lead walks were poured, landscaping was planted, and the pool was filled with water. The cleaning crew provided the finishing touch with a thorough clean. The project manager completed final inspections and a punch walk with the homeowners to ensure the home was completed to their specifications. The Forest Manor was completed and closed in August 2017. What’s next for the Grandfather Homes’ Luxury Estate Series? 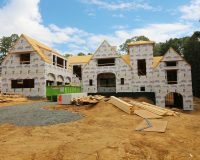 “The Arborway Manor,” a jaw-dropping custom plan by Greg Perry Design, is coming soon to Foxcroft. 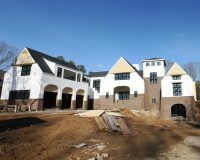 The Arborway Manor is an unique U-shaped courtyard plan featuring 4 bedrooms and 5.1 bathrooms. 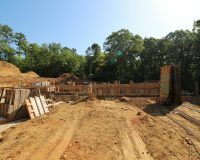 It’s 5,100 heated square feet will include a chef’s kitchen with Thermador appliances and a main level master retreat. Upgrade options include a custom poolscape, pool house, or additional 2-car garage. Contact us for more information.